What Are the Advantages of a Curbless Shower? The bathroom is a critical room that will see a ton of traffic and use over the years. The more attention you give to the design details now, the happier you’ll be with your new home. Below are a few reasons to consider adding a curbless shower to final plans. It can be difficult to get up early in the morning and stumble to the shower. The effort needed to step up and over a barrier on the floor can be more than you have the energy to deal with at the time. The difficulties are compounded if you have anyone with physical limitations, balance issues, or with small children. Removing this barrier using a curbless shower design makes it possible for anyone to the shower without major problems. The floor ridge of a shower in your bathroom breaks up space, making it look smaller and more cramped. Removing this by design gives a cleaner, more unified look. Your bathroom floor space will look enormous and open. Imagine how easy cleaning your shower and bathroom floor can be by losing the obstruction of the shower ridge. The entire bathroom will seem easier to keep clean with the slope of the drain allowing the water to be guided down and away. Avoid dealing with the mold, mildew, and limescale that can attach to the ridge, making it hard to scrub completely clean. 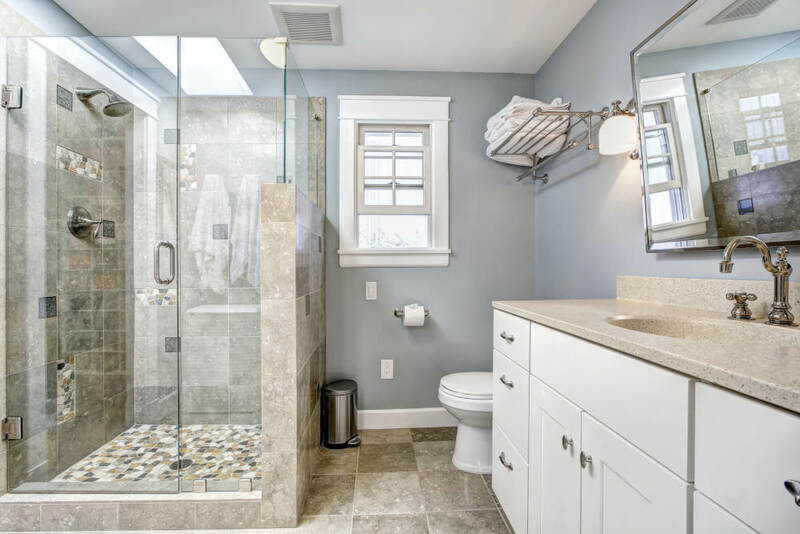 Smaller bathrooms have a confining and cluttered feel with the addition of a traditional shower. The boxy design seems to take up space and make an already challenged room even more difficult to maneuver. The installation of a ridgeless shower does away with this visual and functional problem. The use of customized and frameless glass panels completely opens the space, and the shower virtually disappears before your eyes. The contemporary look and feel will make it one of your favorite rooms in the house. Call on the building experts at Murphy Construction and find out more about incorporating a curbless shower in your new home design. We offer complete new home design and construction services throughout the High Desert area of Southern California.